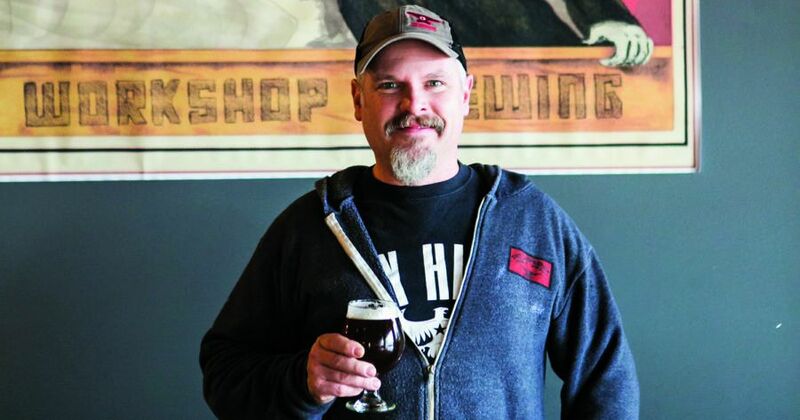 Hailing from Suttons Bay, Corey spent time in San Francisco making mead and getting his culinary chops before moving back to Michigan, where he cooked and brewed at Black Star Farms, helped launch Right Brain Brewery and resides as brewmeister at The Workshop. We catch up with Corey to talk dark beer subtlety, barrel-aged brew and beer with dessert. As a brewer what’s your angle on porters? I really enjoy their malty robust style. In the brewing process I really try to coax the roasty coffee and cocoa flavors out of the malt without getting that bitter astringency. We like to pour our porters through a nitrogen tap, which gives them lighter, creamier texture. Everyone thinks of dark beers as heavy but well-balanced porters are really refreshing. We do this with The Wrecking Bar Porter, one of our Master Series beers. It’s an imperial style, which means higher alcohol and extraction. After fermentation the beer ages in Grand Traverse Distillery used bourbon barrels for two to six months, where it picks up the flavor of the bourbon as well as vanilla and spice notes from the barrel. I love to pair dark beers with desserts to play off the rich cocoa notes in the beer. Drink a porter or stout with the chocolate, vanilla, caramel flavors of something like bananas Foster or a chocolate raspberry torte.